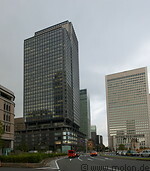 The area around the central station of Tokyo consists mostly of modern high rise buildings and skyscrapers, but there are also a few older buildings in European style, such as for instance the Bank of Japan and the Sumitomo Mitsui bank. The Marunouchi building next to the train station contains a department store and an observation platform on the top. The Ningyocho area is full of small restaurants.